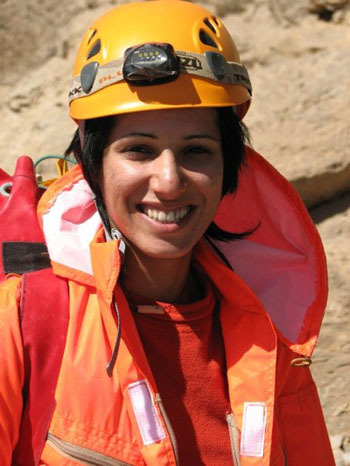 That self-statement Nasim Eshqi spoke of during our interview seems to ring true even outside of Nasim’s rock fall adventures in climbing. They reflect something that is almost necessary for her: the ability to be free to explore ; to not be held captive in any one place or she will fight her way out even if it means serious consequences. At the time of the interview, Nasim was making moves to get out of her hometown of Tehran, Iran on a short-term visa. We hope she is doing well and finding luck with work. She is definitely not one to be held down so we feel confident that we will have more future stories on her adventures…. RRRG: Are you currently at home right now? NE: Yes, in Tehran where I am born and raised. RRRG: What languages do you speak? NE: Farsi, English and climbing language! RRR: Haha…of course. How long have you been rock climbing for? NE: This March 2010, will be 4 years. I am 27 right now and started when I was 23. 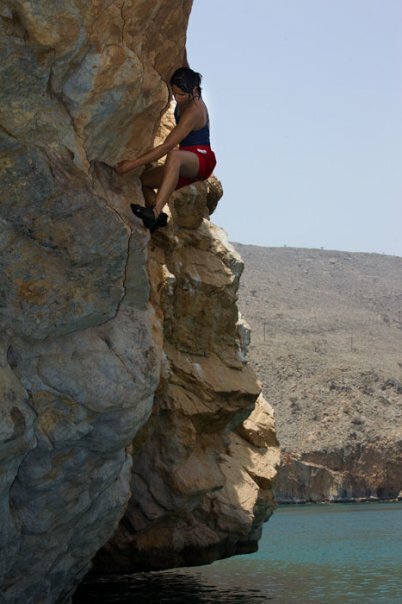 RRRG: What got you inspired to start climbing? 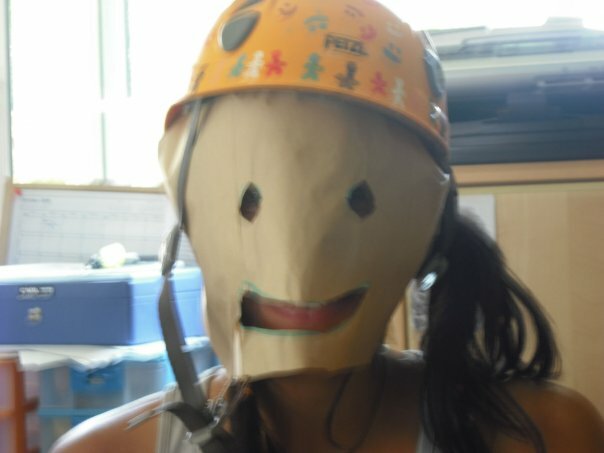 NE: It was some of my mountain climbing friends. I saw it first at 5 years old on television but I never thought there was a climbing gym in Iran where I could first learn. When I got to University, I went for a big climb as they do in all the Universities. They picked the 4 strongest students for a climbing trek up to Mt. Damavand and I was chosen. RRRG: Was this technical climbing with snow and ice? Or just hiking? NE: No, just a hike to the summit. 5,781 meters. It was really hard for me at the time because it was my first experience and I didn’t know anything about alititude sickness. I never heard about it! But the good thing is, the way down, I met some people who became friends and I started to hang out with them and learned how to rock climb. RRRG: So you were sick but you still kept trying to make the summit? RRRG: What a way to charge and not give in. NE: Well, the reason is because in my main sport at the time, Thai kickboxing, I never lost in the 10 years that I was fighting. I was undefeated in my country. I thought I was so good at everything and after Mt. Damavand, I figured out I was really nothing on the mountain. NE: You know, I just never lost at anything before that. I saw other ladies who weren’t as physically stronger than I was and they did okay. But it was really, really good that I found out that I was nothing on the mountain. RRRG: I want to hear more about your kickboxing history. How old were you when you started training as a Thai kickboxer? NE: I was 11 years old. I loved Bruce Lee, Mike Tyson and some other boxers. RRRG: That would be awesome if we could see some photos of your fighting days..
NE: I would like to give you photos but I don’t have photos in competition. You can never take photos in Iran. It would be considered illegal. RRRG: Oh really…do you compete anymore? NE I do it as fun now. I love rock and mostly snowboard and ski right now during the winter. I also love running, biking and skating. RRRG: I want to ask you about your country….do a lot of women rockclimb or mountaineer? Is it okay for women to do this? 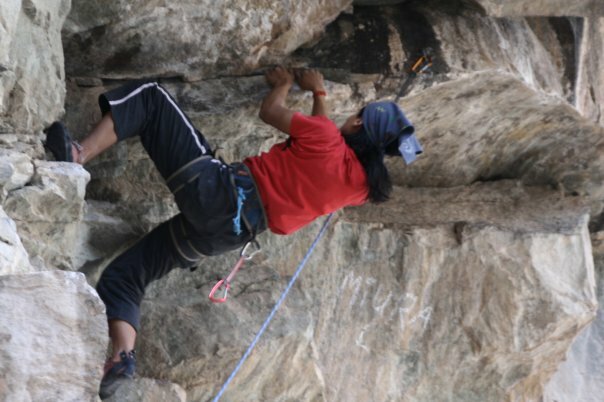 NE: Yes there are lots of woman in climbing and mountaineering in my country. There were females in my trek up Damavand. There is no limitation for women in mountaineer, they can trek if they want to. I also have a great friend that is, I think, stronger than a lot of men. RRRG: But how do the people in Iran see athletic women? What do you think the society’s perspective of them is? NE: Men like to be friends with these athletic women but not married to them. But it doesn’t matter anyway because we (strong women) don’t need these weak men. 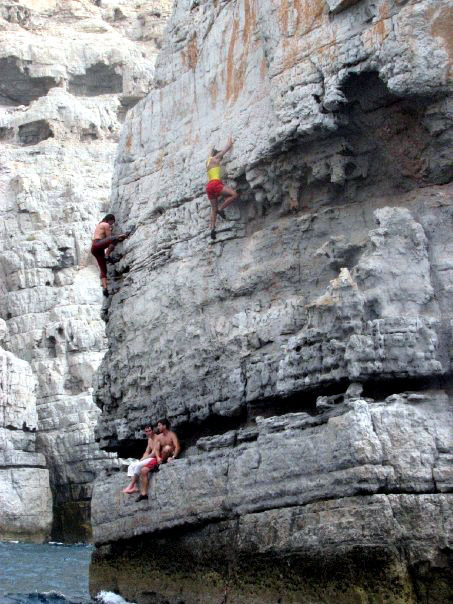 RRRG: hahah…So what kind of climbing do you do most partake in? Traditional, sport, bouldering, ice? NE: My favorite is multi-pitch traditional climbing. My aim is always for some hard, trad climbing. Big walls are my purest pleasure! 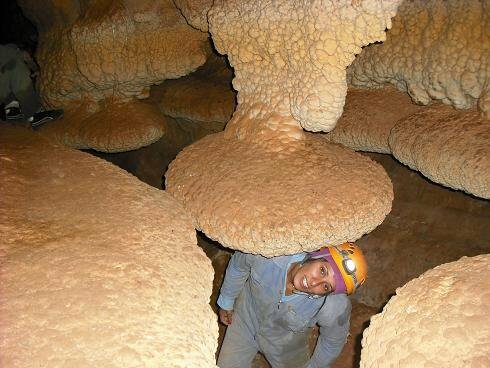 I’ve only climbed them in Iran, in Alamkooh, but I want to do it all over the world! The only problem is getting visas for an Iranian is difficult, so I’ve only been able to climb in Iran and a little in the UAE (United Arab Emirates). RRRG: I’m sorry to hear that. How unfair for you…..
NE: It’s difficult because of the policies. But I will do something. I believe that nothing can stop us if we want to do it. RRRG: Do you ever feel afraid on any climbs? NE: Yes, but its a lovely feeling. It’s hardest dealing with things we have no control over. 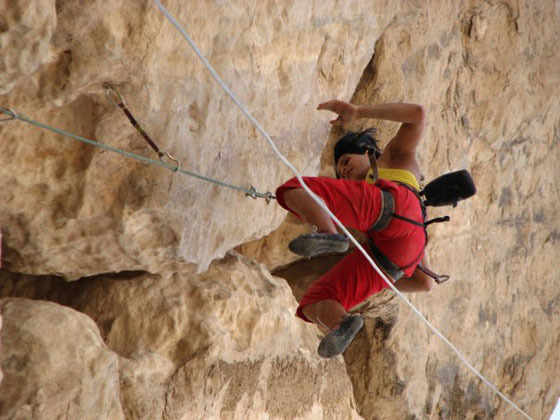 Last year, we wanted to bolt some multi-pitch routes in Alamkooh. It’s really hard though. The weather kept changing and we could not finish it. It’s the most difficult area in Iran with its big glacier to cross and after that it’s just a big, big wall. Some real granite! Breaking rocks is what I fear the most. It’s happened to me many times. It doesn’t hurt too bad when some of the rocks hit you but sometimes it can be painful. Like, when I tried to bolt a route with a sky hook, after the third skyhook, i tried to bolt with drill and the whole rock broke and I had a big fall. It was so painful, I hit the wall with both knees. I fell about 10 meters and thought both my knees were broken but they weren’t. I think because my body is fit from other sports I used to do a lot, I’m fit to take any kind of accidents. Staying strong has helped me. RRRG: How do you control your fears when these situations arise and you feel scared? NE: Well, I think back and one time, I was in Alamkooh on a first ascent of a multipitch route that wasn’t that hard of a grade but very exposed. Loose rocks were falling on my belayer and I; it was the most scared I had ever felt. I was so afraid that I was frozen and could not move. I was above my gear trying to get higher when the rocks started falling but there were just too many rocks coming down on us that I could not move. I just thought, if I fall here, I will die. So I told myself, ‘Nasim, you will die if you do nothing. It’s better to move and die trying than to not move at all and die.’. So I carefully moved up higher and here I am. 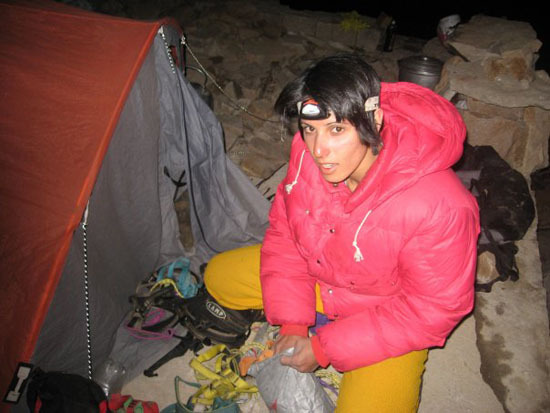 RRRG: Are there many women in Iran doing first ascents of these routes? NE: If there are, I do not seem them in Iran. The women here engage in climbing sport and even mountaineering but I don’t have any female partners here for trad or first ascents in trad. Maybe there are but I just don’t know of any. RRRG: So do you have to wear a cover in Iran to hide your body and hair? NE: During the hottest time in summer we have to climb with polar clothes in the city but in the mountain its up to you! I’ll just wear a t-shirt, trousers and my helmet in the mountains. I don’t like having to be covered though. RRRG: I saw this movie about a modern Iranian girl…the cartoon movie..called Persepolis. Have you seen it? It’s such a great movie. RRRG: hahaha….oh jeez. What do you do for work right now? NE: I am coming back to Dubai to look for work. If I can’t find work, I’ll have to do something else. I can find a good job here that I have certification for (coaching, sport training and physical education) but I don’t want to live here. RRRG: Do your mom and dad like that you climb? Or do they get scared for you? RRRG: Okay…I was going to ask you how you felt about that but it seems obvious. Hahaa…but do you think you’ll ever want to be married and have children? RRRG: Do your brothers and sister climb too? NE: Just my sister…she boulders but dislikes rope. RRRG: So when are you leaving for Dubai? NE: I’m planning to go caving this weekend and then that week I will move. RRRG: Why do you choose to move there? NE: I have a one month visa so far and I will look for work, But in all honestly, I am trying to get out of Iran and it’s the easiest way. I would like to be in Europe or the US. New life, new experiences, new rock! 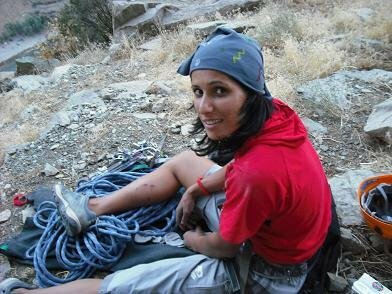 RRRG: So are there any women that climb right now that inspire you right now? NE: Just Lynn Hill. I think she is great. 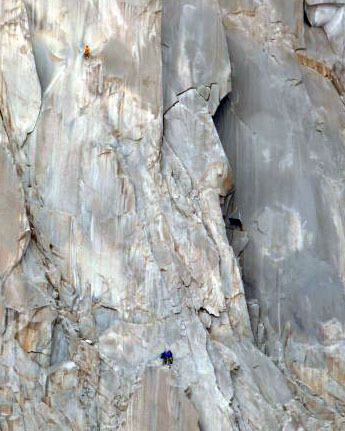 She broke a lot of limitations that people thought women had in climbing. RRRG: What are your future plans? 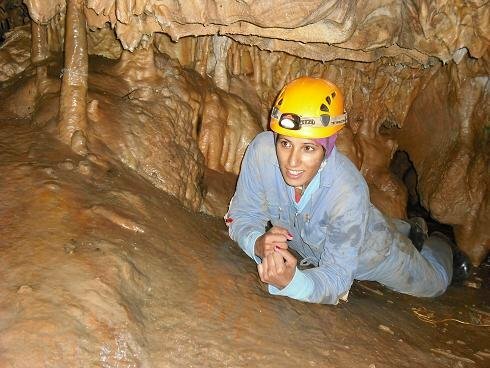 NE: More travel, more climbing, mountaineering and caving. Under and below rocks. If I don’t find a job in Dubai, I would like to go find work and live in Turkey. RRRG: Thank you for taking the time to speak with us Nasim. We wish you fun and safe climbing. « Why we love Aurelie! France’s BMX Super Wonder…. Ey! Buena entrevista! Nassim, un abrazo desde España!